A lot of people don’t take TikTok seriously. When it comes to virility, it’s all about the discovery algorithm. Every major social content platform has its own discovery algorithm that prioritizes certain characteristics of a piece of content and chooses what gets seen by users most. For instance, YouTube is well known to prioritize watch time over most everything. So if your YouTube upload exceeds 10 minutes and viewers watch the whole thing, then it will be boosted in the rankings. Facebook and Instagram prioritize engagement, so content that gets more likes and comments than usual will be sure to show up first in the feed and discover sections. 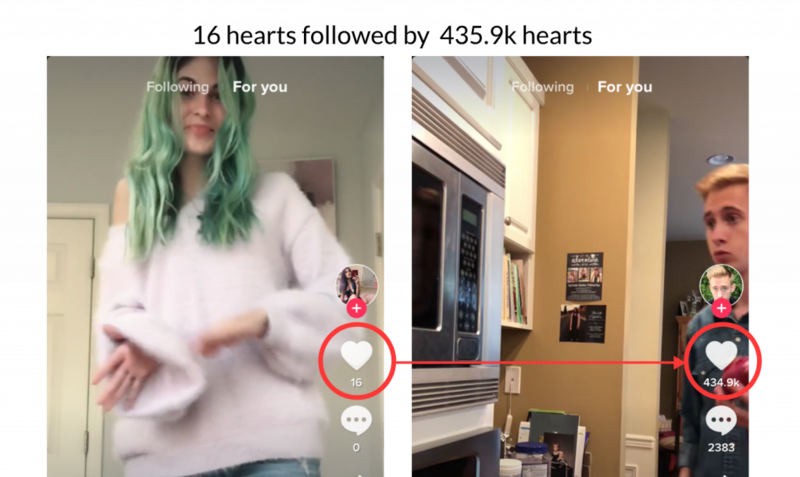 Unlike every other platform’s recommendation algorithm, however, TikTok is able to push content to new audiences before it has proven engagement. Their algorithm allows for undiscovered videos to be shown to complete strangers. This becomes obvious when swiping through the main TikTok feed. As you proceed, interspersed with viral videos with millions of hearts, you will likely be served a video with less than 10 hearts, or only a thousand. If you want to learn all of the ways to take advantage of Musical.ly and TikTok, get the Edfluence course now. Why is TikTok able to do this? It is mostly related to content length. Because all TikTok content is 15-60 seconds, they can afford to push “riskier” videos to their audience, as long as they have engaging content soon after, people keep swiping and overall watch times do not decrease. The average trending video length on YouTube is 4 minutes and 30 seconds, whereas the average TikTok video is closer to 30 seconds. Both apps have average session duration of around 40 minutes. So in the same period of time, one user on TikTok is exposed to over 10 times as many creators as on YouTube. This gives people who are just getting started as social media creators a far greater chance to bubble up in the feed, to catch a massive audience’s attention, and to rake in fans early on. But the main feed is not TikToks only viral abetting feature. Participating in trends and challenges provides yet another strategy to bubble up relevant content to fans who consistently peruse through this section. Located in the search tab of the app, the trends on TikTok get far higher engagement than the hashtags of Twitter and Instagram in part due to more manual curation and engaging gif previews, making them a better platform to be discovered on as a creator. Even more, the duets feature allows people to react to other videos and post their take side by side with the same sound track. Reaction videos and collaborations have been common practice on YouTube for years, but TikTok was the first platform to effectively productize this creative behavior, allowing anyone to benefit from viral content by incorporating it into their own videos, while simultaneously giving even more exposures to the original creator. These viral discovery features are enabling new social media super stars to blow up faster than ever before. Consider the number one western account on TikTok right now, Lisa and Lena, two German twins who have grown to 31 million followers in under 3 on TikTok, putting them at an average of gaining 861,000 new fans per month. Compare this to the number one YouTube account, PewDiePie, who has 67 million subscribers as of now, but has been posting for over 8 years, putting him at an average of 700,000 new subs per month, less than the TikTok counter parts. This shows the app’s massive potential to mint social media super stars, and fast. These stars are able to easily monetize their following by partnering with music agencies who want to expose new songs to the youth demographic, and are willing to pay TikTok stars up to $8,000 per million fans to post a video with their song. Jake Paul, with over 5 million TikTok fans, says this kind of deal is great as a creator because it is not noticeably branded, but is an “organic” way to make money from posting a video. So before you overlook TikTok, first consider the viral power of the app. As more creators recognize its potential, perhaps a greater variety content will flood to the app. If this happens, TikTok could start to capture new demographics, escape its somewhat kiddy reputation, and start to compete head to head with the likes of YouTube, Instagram and Facebook. To learn more detailed tips on how to get started creating on TikTok, make sure to check out Jake Paul’s dedicated social media course Edfluence!